Hey hey! Guess what I’m going to do? I’m gonna make a fab fatty zine! Now, before you ask, a zine is a hand-made, self published, (usually) paper-copy publication. I used to make one in my early 20’s when I owned a music store, that had all kinds of stuff in it – poetry, artwork, music, book and movie reviews, jokes, an agony aunt, whatever came to mind. If you would like to get your hands on an already published fab fatty zine, check out Two By Four by Michaela and Chris Nowell. 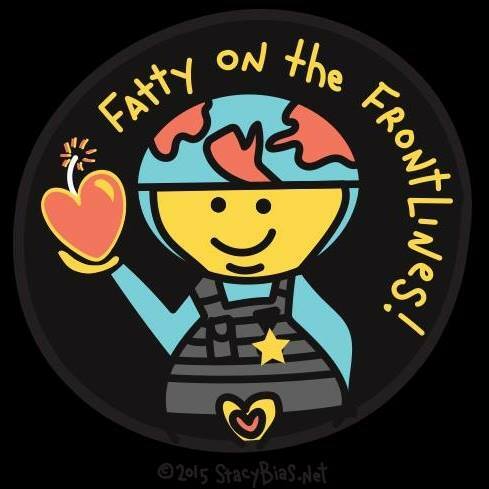 So yeah, I want to make one chock-full of fat positivity. And I’m looking for contributions! Would you like to be in a zine? Cos you totally can, if you want to contribute something. It must be on the topic of fat/fatness and be fat positive. This zine will be a celebration of all things fat. It must be able to be reproduced in black and white on no bigger than A4 paper. This helps me keep the cost down for the actual zine when it is published. It must not marginalise, oppress, other or dismiss other under-privileged people. Otherwise, it’s pretty much up to you! For example at the moment I’m working on a tongue-in-cheek piece about fat fashion “rules” which I hope to have an awesome piece of art to accompany it. What I’d really like to see is some radical stuff. Stuff that is overwhelmingly celebratory of fat people and fat bodies. I want to “glorify obesity”. Now, I’m not planning to make a profit on this zine, I will only be charging enough to cover printing and postage (where needed). So all contributions will be voluntary and of course you will get FULL credit for your work. And I will send you a free copy of the zine if your work is published. The other thing I’m looking for is an awesome name for this zine. Something that is empowering and bold and radical and that says “We are fat and we are awesome!” And that is FUN. So if you can think of anything, let me know. If you would like to contribute or have any questions that you would like me to answer privately, please email me at fatheffalump at gmail dot com. Closing date for contributions is Friday 25th of May as I have two weeks “staycation” booked off work from the 27th which will give me time to put it all together and prep it for distribution. If there is something in particular you would like to see in a fab fatty zine, do let me know in the comments and I will see what I can do. Well, what a day I have had! As I mentioned in my previous post, today was the day that I met with the team from the Australian Women’s Weekly (AWW) for a photo shoot to go with the interview I recorded a couple of weeks ago. I’ll be honest, I was as nervous as hell. AWW is a big deal. It’s an absolute juggernaut in Australia, a cultural touchstone that sails right down the centre of our society. Everyone knows it, 1 in 4 households purchase it, and even more come in contact with a copy somewhere – be it one belonging to a friend or family member, a copy in the doctor’s office, the library, or just browsing in the aisles of the supermarket. I believe it’s really important that we get our message in these incredibly mainstream places – the more people we get to, the more fatties will start to think twice about allowing the world to beat them into submission. There is of course always a risk with mainstream media, but it’s one I’m willing to take. So long as I stay true to myself, then I’m happy to throw myself into this and reach out. It’s scary, but I think it has to be done. So yeah, I was awake at FOUR AM this morning. Totally wired, really nervous and just gobsmacked that this is where my life has taken me. I caught the bus into town fairly early (I like to be early – that’s my thing) and had a leisurely breakfast in a little cafe I like in town before catching the bus out to Newstead where the studio that had been hired by AWW was located. I am so, so glad that I was allowed to bring Lauren and Isaac (Gurrieri and Brown, from Griffith University) with me today, to get all meta and photograph the photography, because not only did we get some more shots for the project we are working on, but I had two people whom I feel comfortable with, and who kept me focused on what really matters to me. I can’t thank Lauren and Isaac enough for being there today – and there was a moment when Lauren and I had a quiet chat between shots that just helped me so much. I was feeling quite, I guess sensory overload – all the lights and noise and scents and unfamiliar clothes etc was doing my head in and I was forgetting to just be me, and Lauren really brought me back to where I needed to be. I think the best photos will be those at the end of the shoot, because I was able to have my head in the right space. Also, Lauren has provided me with a few photos to share with you all here. Thanks Lauren! Now, when the stylist Tanja Mrnjaus called me a few days ago and asked me what clothing label I would like to wear on the day, my first thought went of course, to Autograph Fashion. Not only because I have a good working relationship with them, but also because a) they cater to my size, when so many don’t, b) they are clothes that I actually do wear every day myself and c) I know they are trying very hard to get it right for their customers. So we arranged for Tanja to contact them, I popped into my local store and picked a few things I liked with my fave fab Autograph lady Michelle, and then Tanja worked those into “looks” that Autograph very kindly loaned us a wardrobe of clothes to shoot in today. AWW really went the whole kit and caboodle with this, hiring a fashion stylist (Tanja), a very talented hair and make-up artist Abigael Johnston and photographer Alana Landsberry, and booking a half day in a studio. Abigael started making me up and she really went all out. It was an awful lot of makeup in “reality” – the iPhone shot I took shows just how much I had on, but of course that doesn’t show up in the magazine shots. She really focused on my eyes and I even got to wear mink false eyelashes for the day! She had some beautiful lip colours she mixed up for me too – the first one was such a gorgeous, rich old-world red that I wished it came in an actual lipstick, but she had a secret formula for that one. Because my hair is very short and bright purple, she just gave it a bit of volume and texture for most of the shots, and then when I wore a cocktail dress at the end, slicked it back more to change the look. Abigael starts work on the hair and makeup. I really enjoyed working with Alana, the photographer. She was fun and while a lot of it felt really silly and made me feel quite… weird, she was very perceptive and could see when I wasn’t into something. But for me, the best part of the day was when Tanja came back from a nearby cafe and told us she saw some amazing graffiti inside it, and perhaps we could do a shoot in there. So we all traipsed down to the cafe, Alana asked the owner and they were amazing – they let us move their furniture around and take over a little room that was all painted up with pink graffiti of cupcakes and uber-femme art. They even made us the most wild concoction of a milkshake in purple and pink that we used as a prop. All in all it was loads of fun and I think it will be a really positive, joyous set of photos of a fat woman in a major magazine. That’s always a good thing! Check out the colours of that milkshake!